A Balanced Portfolio to Avoid (III): Most Financial Advisors Are Not Fiduciaries! Hedge funds are often peddled as a unique asset class that has outstanding returns that are uncorrelated with the market. In reality, hedge funds are as much an asset class as Las Vegas is. Hedge funds are a general description of private investment companies that are organized as limited partnerships with fund managers as the general partners and investors as limited partners. The keyword here is private. By law they are not supposed to be sold to the public; therefore, they are exempted from government oversight. But sold to the public they are! It is not the first time unscrupulous “financial advisors” have pushed the limit of the law, while the SEC looks the other way. I recently met an entrepreneur friend of mine. I was pleasantly surprised to learn that he had sold his business and was now looking forward to retirement. He has about $1mm in his 401k plan. As any shameless financial advisor would do, I asked him if he had someone helping him manage his money. To say that I was flabbergasted is a serious understatement. With a friend like that, who needs enemies? Watch the show and you’ll know what I meant. In 1993, the Journal of Financial Economics published “Common risk factors in the returns of stocks and bonds” by Fama and French. They examined bond returns in particular through the lens of various asset return models. It’s April 20th 2011 today, my small independent fiduciary wealth management pratice ranked 16th by Google using keyword search “Wealth Management,” My practice is right in between Merrill Lynch and AllianceBernstein in the ranking. I don’t think I am in good company though, since the other two don’t abide by fiduciary standards. Click to get The Informed Investor: 5 Key Concepts for Financial Success. [Adapted from my Morningstar contribution] A year ago this month, after a trip to China I wrote ominously about inflation hitting the US economy like a tsunami. China’s labor costs were galloping at a 20% to 30% clip per year, and so much of what we consume is produced in China now. The Fed was printing money like crazy. So far I have been wrong. The February 2011 inflation rate was 2.11%; though a slight uptick from 1.63% in January, it was by no mean a tsunami. 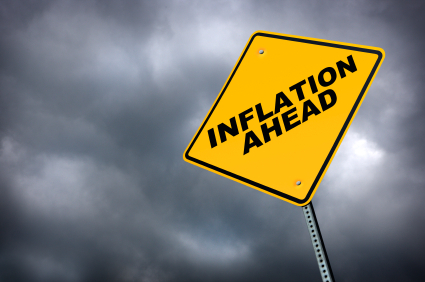 Recently, Fed Chairman Ben Bernanke testified before the Senate Banking Committee that the Fed projects an inflation rate of less than 2% for the next 3 years.